We are only 47 days into 2013 and already proud to show off with some good improvements here at Simonskloof. Not without the great help of our WWOOFer (volunteer) from the Danish hills (he preferred to stay anonymous, so let’s call him Jan) – in fact we easily could blame him for those early morning starts, but rather remember him as a beer guzzling work horse of note! 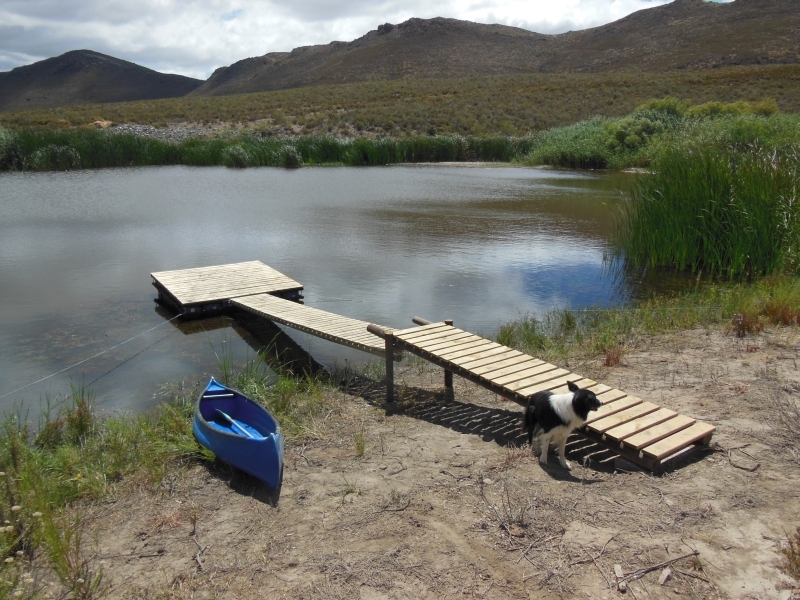 First on the list was digging four more holes for our new Karee trees (Rhus lancea – local to this area) at the campsites – now we got 13 (get the drift?) Karee’s adding more welcoming shade to the camp spots. Then the much needed 2nd camp shower (the former one had washed away in the January 2012 flood) a beautiful timber pole and reed structure next to the stream, yet more private then the old one. 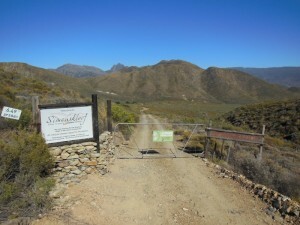 Finally we built the long awaited entrance gate – the signboard had started to gather dust while waiting on the veranda… we also added a traditional farm gate to keep the leopards in and the neighbour’s sheep out of our kloof?! The gaps were filled in with a dry rock wall, here we got a little help from two French WWOOFers who spend some land time, while on an around the world sailing trip – visit their blog for some eye opening perspective of how French visitors see our country… They did not last long though, less than a week in fact, complaining about the heavy “slave labour” here at Simonskloof. This made me appreciate Jan even more and hence double his ration of beer – do I hear anyone say “dop-system…”??? On the to do list we moved to clearing more flood debris from around the oak trees close to our little stream – I guess that was the final straw on the French “donkeys” back… Next in line was a new jetty and attached raft for our farm dam, the old one was also lost to the flood. It still needs some tweaking to balance the raft and make it more “jump” friendly, until then I guess we need to ask our guest to treat it gently… somewhere in between Jan fibre glassed the blue canoe and gave it another coat of paint, while I spend time doing all the much needed admin (see our constantly up dated website and FaceBook page). Then in the middle of January’s heat we headed for the Breede River to have a swim… Naa… We would have loved too, even had our swimming shorts with, but I guess the French were right after all… instead Jan and I sweated away in the reed jungle on the river’s edge, cutting over 1000 pieces of Spanish reed for our cottages new ceilings. Back at the farm after removing the old hessian ceilings (8 years down the line, the geckos had had a jolly good time making the ceiling space their home and toilet all in one – not a nice smelling affair at times) so it was time to refresh it with new insulation, hessian and a reed finish. Just in time for my friend Matthew’s 40th birthday bash here at Simonskloof, we had the ceilings re-sealed (relocating over 25 geckos in the process) and managed to complete two of Orange Cottage’s bedrooms – it looks awesome, to say the least!!! 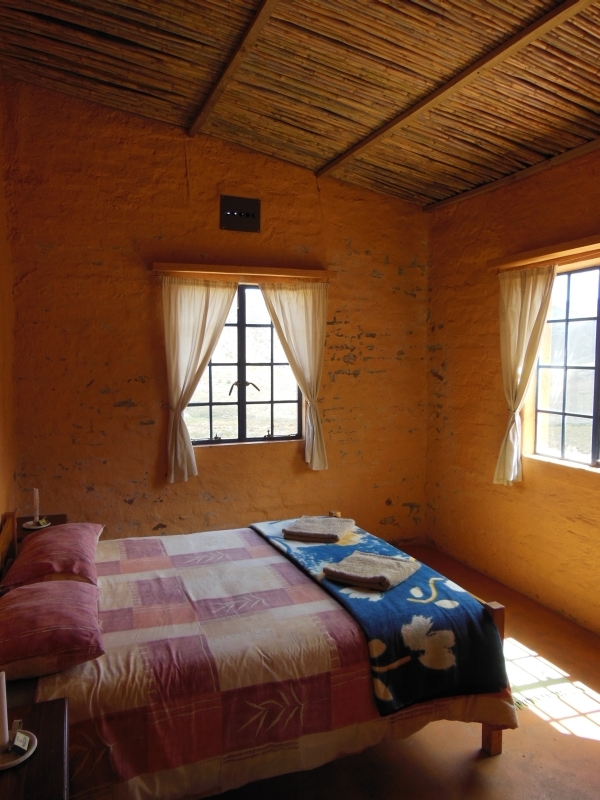 After two month of hard work, Jan well recharged, has hit the road up north to explore the Lowveld then returning home to cold Europe, while we cater for a group of researchers from Holland – After that: Time-out, even for us! See’ya in March. 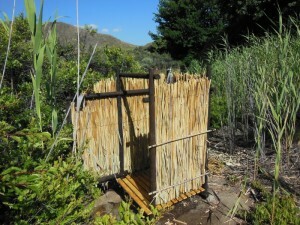 This entry was posted in News and tagged blue canoe, camp shower, entrance gate, jetty and raft, Reed ceiling by Jurgen. Bookmark the permalink.